(PNS) Even before flooding from Hurricane Maria destroyed their home’s contents in 2017, Waleska García Castro and her family faced a human-made threat that could have caused them an even greater disruption. This family, along with others residing near the Martin Peña Channel in San Juan, Puerto Rico, did not have a deed to their dwelling, and they were looking at the possibility of displacement. 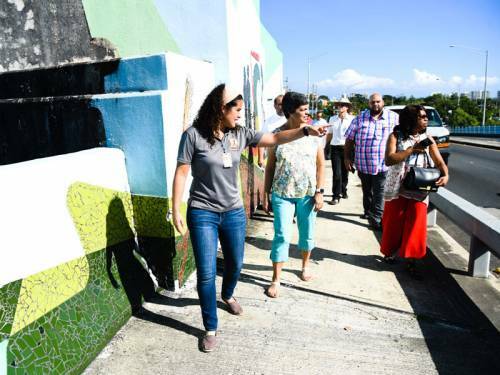 Mariolga Juliá-Pacheco, coordinator of special projects for the Martin Peña Channel Land Trust, leads a tour for staff members of the Compassion, Peace & Justice ministries of the Presbyterian Mission Agency. This threat stemmed from plans to dredge the polluted channel and make other improvements to the waterway. Consequently, property values would likely increase dramatically in this community near San Juan’s financial district, airport and universities. The land would be ripe for speculation and gentrification, and the deedless residents could be forced to leave. Some families have lived in this community for five generations. 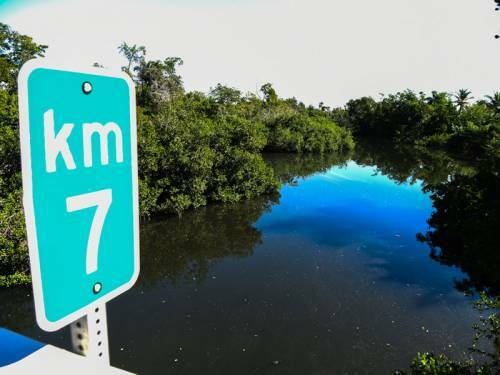 García Castro and other community members are implementing a strategy that will enable them to remain in their homes and enjoy the benefits of the revitalized canal. One Great Hour of Sharing gifts are supporting this effort. The community formed the Martin Peña Channel Land Trust, which has acquired title to a 200-acre tract that is home to 1,500 families. While the trust owns the land, individuals can obtain deeds that give them surface rights to their homes. While determined to keep their homes, community members said they do not oppose the channel’s revitalization. One Great Hour of Sharing gifts are helping residents along the Martin Peña Channel in Puerto Rico remain in their homes and enjoy the benefits of a revitalized channel. The land trust, she explained, “will ensure that a new generation of residents have the opportunity to live along a restored Martín Peña Channel.” The community will own the land in perpetuity, but residents may transfer ownership of their houses through inheritance or sale. In addition to securing land rights, the land trust aspires to tackle other problems, such as sporadic electrical service, mosquito infestations, inadequate transportation and food insecurity. While land trust leaders are excited about improving the community’s quality of life, Juliá-Pacheco said there is still much work to do to ensure that residents acquire surface rights deeds. She emphasizes that the One Great Hour of Sharing grant is helping to accomplish this. A community facilitator, whose salary is partially paid by the grant, is helping families through the tedious process of acquiring deeds for their homes. All three Presbyterian Church (U.S.A.) ministries supported by One Great Hour of Sharing gifts — Presbyterian Disaster Assistance, the Presbyterian Hunger Program and Self-Development of People — are working alongside the land trust. In most Presbyterian congregations, the One Great Hour of Sharing offering is received on Palm Sunday or Easter Sunday.